For over the past few decades, City Contemporary Dance Company (CCDC) is a well known modern dance company not only in Hong Kong but also around the world since 1979. CCDC appoints us to handle the project. A tailor made web based digital music streaming service is developed. 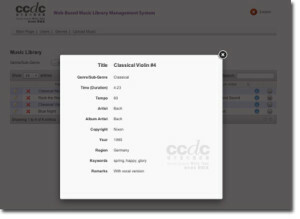 Users can easily find and browse the music library not only by music titles, genres, composers, but also the mood of the music. In cope with company’s copyright policy, streaming only service is provided. Users can browse and listen music with just one click but music download and copy are strictly prohibited. Choreographers can easily browse and find the music for their art production over the thousand available tracks, from classical to electro. And we sure believe this project will inspired artists to produce more acclaimed production in the future.